McQueen. Join Lightning McQueen in Radiator Springs as he prepares his academy of student racers for the Race-O-Rama competition. 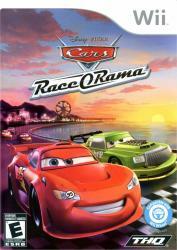 Lightning finds out that Chick Hicks has his own set of academy student racers who don�t always compete fairly. These student racers are preparing to race in the same competitions in order to propel Chick Hick�s academy to the #1 spot. The races take place at various tracks from the beaches, into the cities and off to the Baja desert. Along the way, racers are upgrading their abilities and customizing their look. The finale consists of a fully modified, ultimate Lightning McQueen racing against a fully modified Chick Hicks for the Race-O-Rama trophy. Let the race begin!